On March 12, the boys’ basketball team played in the State championship tournament for the first time in 20 years. 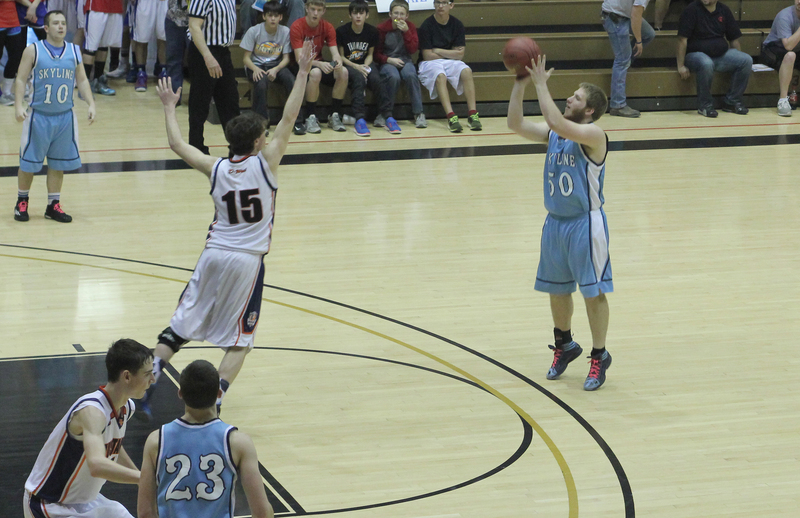 In Sub-State the Thunderbirds knocked off the LaCrosse Leopards in a hard fought game, 42-37. They then defeated the Macksville Mustangs in the final, 42-27. “It was really exciting because it was something I wanted to qualify for ever since I was a little kid,” senior Colin Little said. The T-Birds earned the six seed at State and received a matchup against the three seed, Doniphan West Mustangs. Doniphan West came into the game as the second ranked team in 1A-D1. “I was concerned about how we would react to their press because they are a long, athletic team,” sophomore Jared Shriver said. The boys left Skyline that Thursday morning to make their way to Emporia, stopping at Canton-Galva along the way for a shootaround. The fella’s got to William L. White Auditorium in time to see game one and get prepared for their matchup. Many fans and students made their way to Emporia to support the team for its game. “It was a lot of fun to play in front of that many people and the crowd noise was really cool,” junior Kasey Gilpin said. The T-Birds started off slow and were down 13-4 at the end of the first quarter. The boys put a few more points on the board in the second quarter but were down 22-12 at halftime. The T-Birds came out strong in the second half to take a 25-22 lead, but then the Mustangs answered with a run of their own to take the lead back. Skyline kept it close and interesting until the end, when they came up short, 49-39.